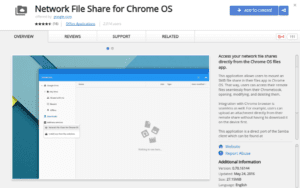 Google’s new app for Chrome OS allows you to mount an SMB file share in your files app in Chrome OS. Although this isn’t new, this is the first native file share client made by Google for Chrome OS. It utilizes a direct port from the Samba client which can be found here. You can download this app for free at the Chrome OS Web Store by clicking the link below. Another push forward for Chrome OS, making it more and more versatile every day. We look forward to what’s next.